Fears of inflation have been misplaced, since there is little evidence that without wage resistance, which depends on the bargaining position of workers, there could be systematic inflation pressures. Last time that workers tried to push back and increase wages was in the 1970s, in which labor’s stronger position, and employers’ resistance to workers’ demands, resulted in high levels of industrial conflict. The graph below shows the number of strikes, using LABORSTA data, and inflation, from the FRED database, and shows that the decrease in inflation has been correlated with lower levels of work stoppages. That’s is why higher commodity prices in the 1970s, including the oil shocks, led to high inflation back then, but has had a marginal impact this time around. This also suggests that the low inflationary pressures in recent times – Bernanke’s Great Moderation – have less to do with Central Bank ‘credible’ policies than with the attack on unions and workers’ rights. The next graph shows the correlation of the number of strikes with the unionization rate in the United States since 1974. Again there seems to be a fairly direct relation between the decline in the unionization rate and the reduction in the degree of conflict in society as measured by strikes. The unionization rate has fallen from more than 30% in the 1960s, to around 11% now. And the attacks on unions, by Republican governors, and the push for Right to Work Legislation, which is basically a law that restricts the ability to form unions, are still very much with us. The price for the stability gained on the back of unions is that inequality has been increasing at a fast pace. With decreasing bargaining power workers’ have been unable to press on for higher wages and these have stagnated. The result is that the share of wages in Gross Domestic Income (GDI) has fallen from around 54% in the early 1970s to close to 44% now. A 10% decrease in the share that workers take home, as seen in the figure below. 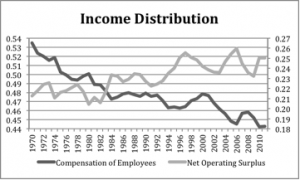 The counter part of the decrease in the share of workers’ is the increase in the so-called Net Operating Surplus, which includes profits, interest, rents and other payments to capital. Wealth inequality is even worse (see this video here). Income inequality is a problem not just from a fairness point of view. For one thing inequality is part of the reason why workers and their families have been driven towards increasing levels of indebtedness over the years, and which are in part responsible for the higher levels of volatility that the economy has to face. More importantly inequality is central to understand why the recoveries from the last recessions have been relatively slow. Lower levels of income have translated into lower levels of consumption, and a slower recovery. So if income distribution is to become an important issue of the next few years, and I do hope it does, we need not only to discuss tax issues, like higher income tax rates for the wealthy, and an elimination of the payroll tax earnings cap, or increasing the minimum wage, but also to promote a renewed effort to protect workers’ rights and unions. Unions and workers’ right should be as high in the Democratic agenda, as gender and gay rights, immigration reform and environmental issues, if they want to promote a more civilized society. This is so interesting blog. You are best listing knowledge provide at this site. I am very excited read this nice article.